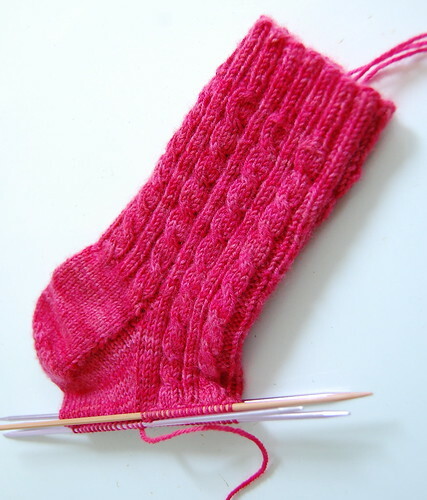 And I turned the heel on my sock! I never did make it the yarn shop yesterday. I should have gone, but I was doing laundry and hanging out with dh and the kids. Maybe I'll go tomorrow? I really need new needles - see how they are mismatched? :) Write later! Congratulations on having a Brilliante blog. See my blog for details. Great job! I love the color on that sock...it looks very comfy! 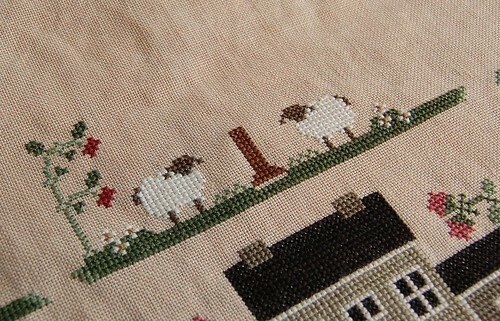 Cute little sheep on LHN! You made lots of progress on your LHN. The sheep are so cute!! I can finally pick mine back up now that the model is out to my LNS. Your sock is so cute! It looks like fun to knit. I need to try and learn even from a book. It has been years since I knitted covers for a cast I had back in the 70's and I have forgotten most of it. Looks great, Nicole! Keep up the great work. Love the stitching and that sock is yummy too! I was so disappointed with myself over the weekend. I went away for the weekend, but took along my Little House Neighborhood, hoping to make some progress on it. I pulled it out on Saturday morning at the hotel, and immediately realized that the ring of floss I brought along didn’t belong with that piece, so I couldn’t stitch on it. Thankfully, I usually travel with 2 projects, so I was able to get some stitching done. Between the RR and the exchanges that I’ve committed to, I don’t know when I’ll be able to get back to my own stitching, but working on this piece is definitely my highest priority. I’m envious of the progress that you’ve made on it! Oooh I love how your neighbourhood is coming along. I love those sheep ( I love sheep!!). I am not getting the sock pic but the sheep really look good. Great progress! I've been enjoying the sock pics...wish I could knit a pair, but I can't do any more than something that is just straight.